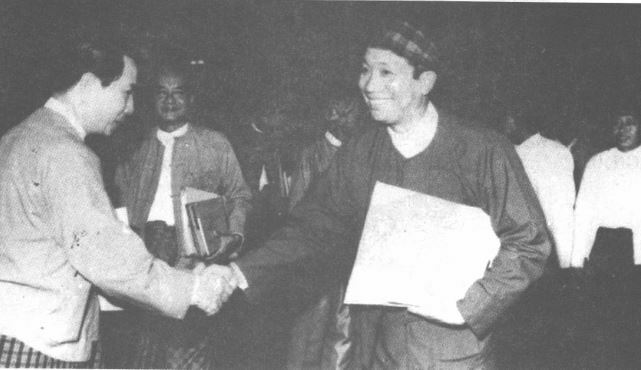 Among the five KIO Heads, Chairman Maran Brang Seng was one of them who took long successive years of his leadership terms since he was nominated with the proposal of meeting held under KIO central committee between January 15 – February 5, 1976 as a Chairman and Head of both KIO and Kachin Independence Council (KIC). KIC, as a steering committee or governing body, is derived from the KIO. It is to enact the law and order, and making the verification on various fields of every department such as Culture and Literature Dept., Education Dept., General Administration Dept., and others. The meeting of KIC and KIO was convened on December 12-25, 1962 at Hkahpawk Camp (Nbapa). KIC became a highly authoritative body from its meeting. KIO Central Committee also became a level next to KIC. While Lahtaw Zau Seng was Head of KIC, Lahtaw Zau Tu his brother was appointed as Chairman KIOCC and Vice Head of KIC too. Lahtaw Zau Seng was in the next level position (vice chairman) to Lahtaw Zau Tu in the KIOCC forming structure. The meeting of KIC/KIO/KIA was convened from 10th to 20th May 1967 at Jingma Yang, Htarahku, in Nmai Walawng region. According to the memorandum of the meeting agreed upon for the re-commission to China, Mr. Maran Brang Seng with a group of 34 members on 9th of July 1967 set off from Machyang Dingsa Camp, General Headquarters, Nmai Walawng region for China. In the month of June 1967, there was a communal riot between the Chinese residential of Burma with the Burmese people in Rangoon, the capital city of the country. During the period, a decade between 1967-1976 China was deeply infused with the ideology of Cultural Revolution Movement under the China Communist Party. Mr. Maran Brang Seng and his group passed across the China border demarcation pillar No. 4 and then into China. They left behind KIA soldiers under the command of Lt. Natsun Hkyen Naw at Chinese border security post, Hu Dung Kai, on the international borderline. Those who followed Mr. Maran Brang Seng for Bejing were Nbang Bum Sinwa, Damya Htingnan, Mangshang Ding Bawm, Hpauna La Gawng, Lahkang Shawng and three personnel attendants. They reached Beijing on 10th August 1967 and met Mr. Chau En-lai, the prime minister of China. Consecutively, in the same year at the end of October, Brig, Lahtaw Zau Tu along with 13 members followed the other route through Lawhkawng Chang-yinghku from General Headquarters, Shingbwi camp to the Chinese border security post Hu Dung Kai. Those who followed in the mission of Brig. Lahtaw Zau Tu were Pungshwi Zau Seng, Lama La Ring, Maran Brang Seng, Lahtaw Zau Dan, Lamung Tu Jai, Malizup Zau Mai, Maran Brang Tawng, Maji Zau Ing, Zahkung Ting Ying, Gauri Zau Seng, Dauje Seng Hpung, Nanghi Yawhan, Shanghting Thing Nan (typist). Only La-nyaw Zawng Hra was left as in charge of KIC headquarters staff office. Almost 700 KIA soldiers who followed along with Brig. Lahtaw Zau Tu were remained and stationed at Chinese border security post Hu Dung Kai. They also met with Chou En-lai following the basis on same account. As a matter of fact, due to the CCP leaders’ influential position, meetings were also arranged between KIO leaders and the Burma Communist Party (BCP) leaders – Thakhin Ba Thein Tin, Thahkin Pe Tint, Khin Maung Gyi and many others including Lahpai Naw Seng from PNDF. During the year in 1967, the Chinese – Burmese communal issue at Rangoon was so intensified to cultivate the actions organizing the Burma Communist Party (BCP) and Pawng-yawng National Defense Force (PNDF) in vengeance of China for the dishonored act over the Chinese residential by the Burmese people. While in Beijing KIO was also persuaded to be under BCP along with PNDF led by Lahpai Naw Seng. But the proposal was denied by Brig. Lahtaw Zau Tu and the situation brought into a conflict of war between KIO and BCP – PNDF in Shan state ranging from Munggu Hpawngseng on 1st January 1968 with a series of war for about 8 years. In due course Brig. Lahtaw Zaw Tu and his group retreated from China and reached their headquarters Shingbwi camp on 10th February 1968. (4) Politically autonomy with self-determination within the Union of Burma. A meeting of KIO central held between June and September 1969 was called upon to review the overall political status in order to upgrade and adjust relevantly to the task for which the amendments bear the act “Act 69” according to the year of the meeting 1969 at Baknoi Prang Sha-it Yang, Pajau Bum. Re-establishment of the new amendments constitutes an organized act of the Party Committee System for which Kachin Independence Organization Central Committee (KIOCC) was authorized as the highest powerful body and KIC again came under its next position. Lahtaw Zau Seng (GOC) was reappointed as Chairman and Head of both KIOCC and KIC respectively. Thus the KIOCC with its organized party committee system decides and directs the political objective of the nation. There were only 2 brigades of KIA known as “Model Brigades” before 1972. The year 1962-72 marked the BCP’s greatest ever period of military expansion. The BCP’s main immediate target was the KIO which had already overrun most of the China border areas in the Kachin State and controlled much of the Kachin sub-state region in the northern Shan State. 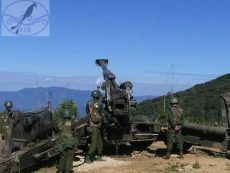 At the height of the BCP’s offensive, the fighting among the three sides – KIA, Revolutionary Council Army and BCP broke out intensely in the Kachin State and Kachin sub-state areas. During this time, contacts for peace talks were made between Lt.Col. Lahtaw Zau Dan (Kachin sub-state region) and Col. Sein Mya (No. 99 Light Infantry Division). In June 1972, three and a half month ceasefire was agreed between Lt.Col. Lahtaw Zau Dan (KIA) and Col. Aye Ko (North-East Command). The Revolutionary Council tried to persuade the KIO to join forces against the BCP. In return, the KIO requested supplies from the government. However, Brig. San Yu (Voice Chief of Staff and Deputy Ministry for Defense and Planning) turned down this request. In the end the three and a half month long ceasefire was broken. During the year of peace talks failure in 1972 between KIO and Revolutionary Council government led by Gen. Ne Win, the central committee of KIO once again met on August 24 – October 27. In this meeting, the KIOCC decided to establish other 2 more brigades. There are 1st Brigades, 2nd Brigade, 3rd Brigade and 4th Brigade. 1st Brigade was located to the front of Northern Division, Mali-Nmai Walawng area, under which comes 4th, 7th and 10th Battalion. The 2nd Brigade to the front of Western Division, west of Irrawaddy river – Hukawng valley up to Indo-Burma (Kachin State) border, under which comes 5th, 6th and 11th Battalion. The 3rd Brigade to the front of Eastern Division, east of Irrawaddy river, under which comes 1st and 3rd Battalion. The 4th Brigade to the front of Southern Division, Kachin sub-state region under Shan State, under which comes 2nd, 8th and 9th Battalion. KIA has its Strength recruited twice during the year 1972. This article was first published in Kachin Research Journal Vol III in Jan, 2010.